We welcome you to enjoy luxury bed and breakfast at The Limes, our historic Grade II listed manor house in the centre of the conservation village of Bearsted. Our location couldn't be better, overlooking the beautiful village green and within strolling distance of four excellent restaurants. The Limes was originally built in the 15th C and because of the sheer size of the house one would guess by a local family of some wealth and standing. Altered and adapted over the centuries the result is now a charming mix of ancient beams, large inglenook fireplaces and intriguing twists and turns. 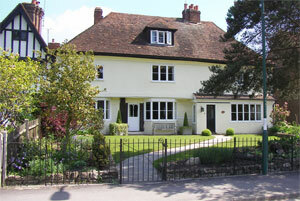 Although in a village setting we are five minutes drive from the M20 and only one hour out of London. Do come and join us at The Limes and enjoy for yourselves the unique style and amazing location of our lovely, old house........a delightful alternative to a chain hotel!